Project: Saint John’s Cathedral, Denver. 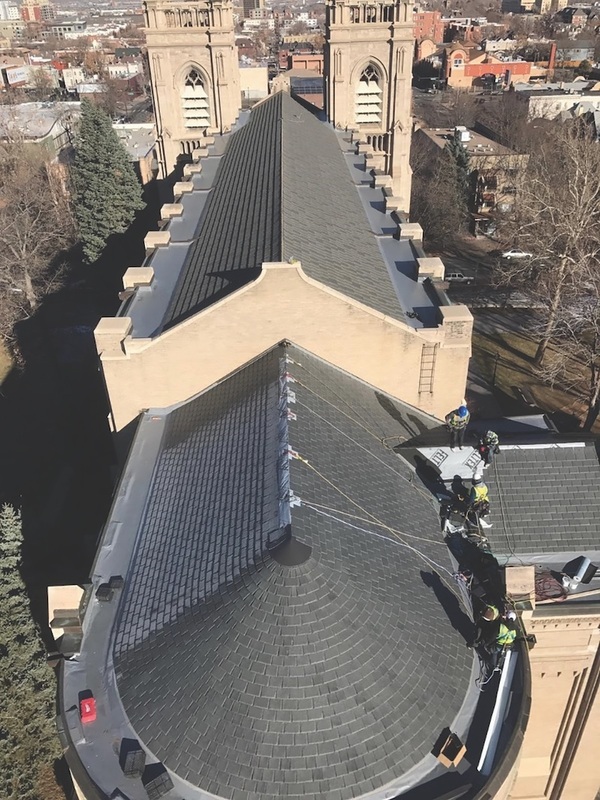 Problem: A new roof was needed to protect the historic structure from the rigors of the Rocky Mountain region’s severe weather. Solution: DaVinci Roofscapes single-width composite tiles were used to protect the 90-foot-tall church without compromising its aesthetics. The installer used 39 squares of Slate Gray, 55 in a canyon color, and 151 in the European blend. On the team: Horn Brothers Roofing. Project: Spoke apartment parking garage, Chicago. Problem: The parking garage was a concrete monstrosity that needed to find a balance between ventilating airborne contaminants and achieving a pleasing look. 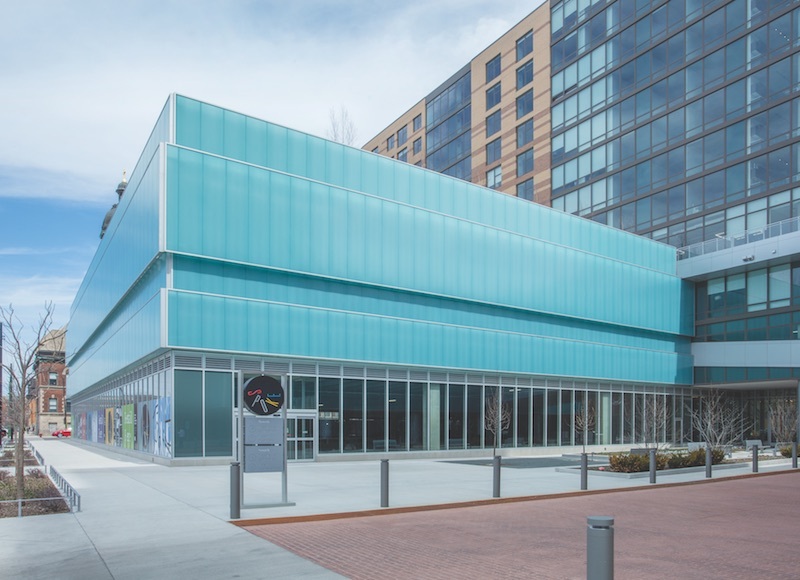 Solution: The garage was clad with 17,430 sf of “floating” Pentaglas cladding panels to improve the aesthetics and allow air to move into and around the garage while exhausting CO2. On the team: FitzGerald Associates Architects. Project: Moynihan Train Station, New York. 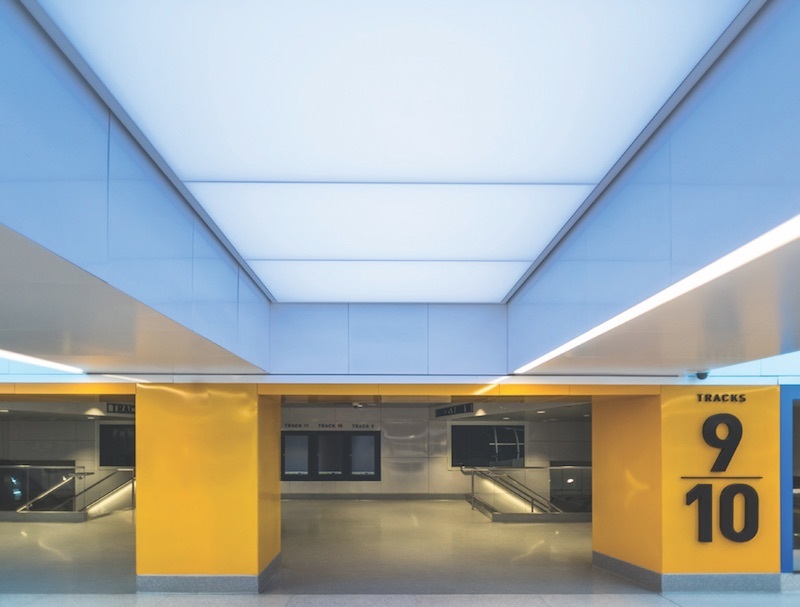 Problem: The architects wanted a ceiling system to illuminate an underground walkway. Solution: The SEFAR Architecture Lightframe ceiling system, a modular system. Two layers of IA-85-OP fabric were used with the system to allow for even light distribution. In addition to uniformly lighting the space, the modules have an NRC value of 0.90 to reduce noise in the terminal hallways. On the team: Skidmore, Owings & Merrill. Project: Banc of California Stadium, Los Angeles. 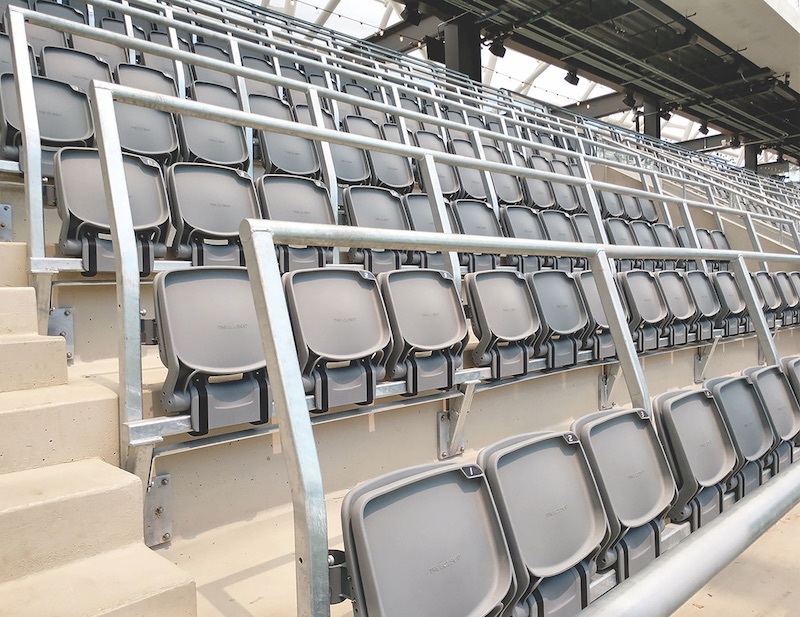 Problem: The first standing supporter section in a U.S. stadium needed a custom railing to safely allow fans to watch the match from the unprecedented pitch of 34 degrees. Solution: A custom standing railing with integrated seating. The riser-mounted metal-railing frame angles back to create a comfortable lean rail for standing supporters. On the team: Gensler (architect), PCL Contracting (GC). 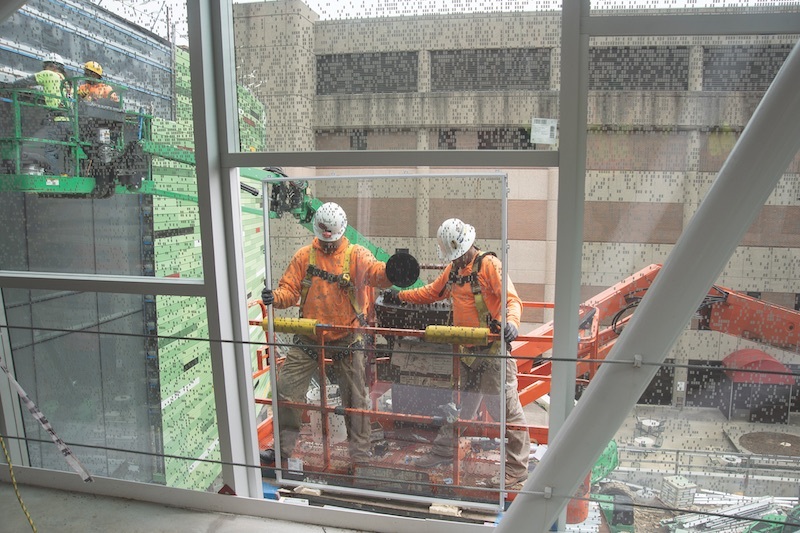 Project: The Novak Center for Children’s Health at the University of Louisville’s Health Sciences Center. Problem: The university wanted the connection between the Novak Center and the Chestnut Street Garage to be an airy, naturally lit pedestrian bridge. Solution: The third-floor bridge used 138 rectangular pieces of Digital Distinctions glass by Viracon, each digitally printed with a custom block pattern. On the team: Messer Construction (CM), Koch Corp. of Louisville (installer). Project: Hennepin County Library, Minneapolis. 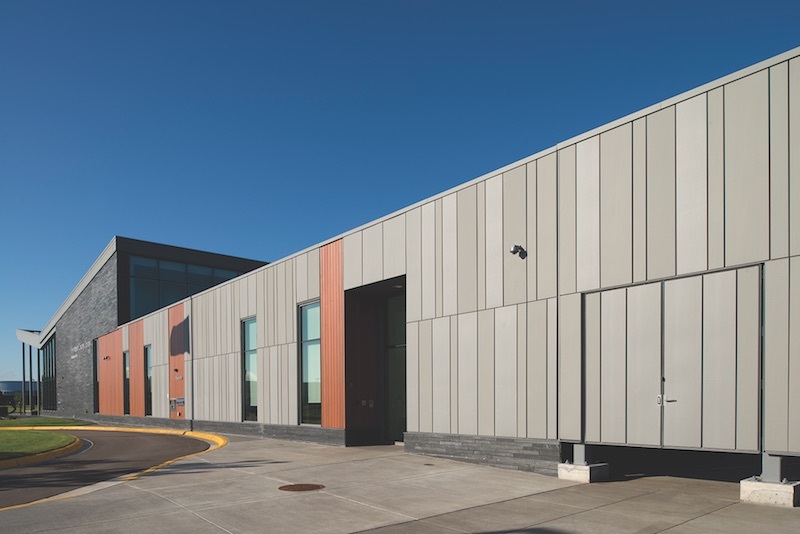 Problem: HGA needed a metal panel that was efficient in terms of raw material, size, panel span, framing, and manufacturing waste—without compromising design. Solution: Dri-Design VMZINC Wall Panels were chosen for their long life span. They don’t use tapes, sealants, or gaskets, which eliminates the streaking and staining associated with such products. They forgo a plastic core, making them noncombustible. On the team: HGA (architect), Progressive Building Systems (panel installation).